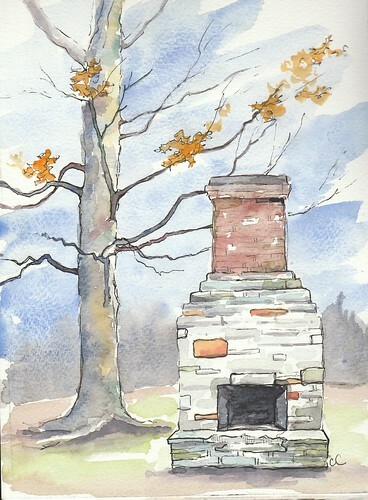 Hearth in the Woods – Watercolor Sketch – Let's Paint Nature! In the Midwest where chill reigns for a quarter of the year, you will find a solemn hearth if you’re lucky in the midst of the woods. Not every preserve has one, but when you happen to spot one, it’s like a treasure. This one is located at Knoch Knolls Park in Naperville, IL. On this day, I only wish I had wood and permission to start a fire, like I did a few years ago at Heller Woods. Click here to see photo. Instead of seeing the warm glow against the oak trees, I will settle for the warm sounds of nagging nuthatches with their nasally, “heh, heh, heh, heh” keeping me company in those oaks. How is their sound warm, you ask? It keeps me there a minute longer, no matter what the temperature, and suddenly the cold disappears. A hearth in the woods–what a great idea for an area with a lot of winter to deal with. Love the photo of the fire, and this painting, & I love the idea of having a fireplace in the sanctuary of the woods. Reminds me of my newest book, The Cozy Life, about hygge–Danish for enjoying comfort whatever the season–a candle, good food, a wrap, and hopefully a warm fire. Love your art work!